Matt wanted to lose the weight he acquired and saw that his friends found success with HitchFit. He followed Micah La Certe’s principles and the rest is history. Like many, I was sick and tired of being sick and tired. I was unhappy with myself on many levels. I was at the heaviest I had ever been in my life and I knew I was heading toward the big D - Diabetes. I was leading an unhealthy life at EVERY level. I was eating poorly. I was not active. I was tired and lethargic all the time. To make matters worse, I was taking a lot of sleep aids just to sleep. Despite the sleep aids, I was averaging 4-5 hours of sleep per night. Plus, I was on various medications for my heartburn and stomach issues for several years. My diet consistent primarily of processed carbs and fats with very little quality protein. I was sluggish and I didn't have the energy for my work nor my family. I was in deep, dark hole and needed to get out of it. I even had a poor view on life. I was fortunate to have had a friend who just completed his 16 weeks with HitchFit.com. I also had other friends who were currently on their own personal fitness plan from HitchFit. I knew it was legit and not a gimmick. My friend's programs were based on real exercises and a real nutritional plan! They were not starving themselves and swallowing a bunch of questionable supplements to lose weight. They were losing the weight in the proper manner and by naturally boosting their metabolism through exercise proper nutrition. I knew I needed this program. Of course, I had reservations. But, the worse thing I could lose was weight, right? I knew if I stayed committed, I'd lose weight. Even if I didn't reach my goal, I'd still be healthier than I when I started. Little did I know that I would have to reevaluate my goal as I reached my initial goal in 60 days! Micah motivated me and pushed me to work harder. He reminded how important it is to have very specific goals and focus on them with laser-intensity. He helped me realize that I had more inside myself than I was giving myself credit. In the end, I far exceeded my expectations of what I could accomplish. In a simple phrase, I did it with hard work and sweat equity. But, the key was a structured plan provided through Micah LaCerte at www.hitchfit.com. I had been active before and I knew "somewhat" of what I needed to do to succeed. However, I knew I needed structure or I would just be like many people I see in the gym who just wander around from exercise to exercise without any true focus or purpose. It's important to note that I received an overall, extensive fitness and nutritional plan-I was not on a "diet." I utilized a customized plan that was tailored to not only my goals but my body type. I was prescribed separate monthly plans. Each month was different from the one previous in regardless. On day 1 of each month, I could not do or would struggle to get all the exercises completed. By the end of each month, I was amazed at the progress I had made. Each week I had to send my weight to Micah with monthly photos as well. Throughout the program, I could (and did) send Micah questions. Having the expert knowledge and support was vital. It was important that I made each day better than the day previous. Struggles and challenges were a part of it, but I kept pushing through. Some days I was weak, but other days I was strong. I had to keep focused and keep my end goal at the top of my priorities. 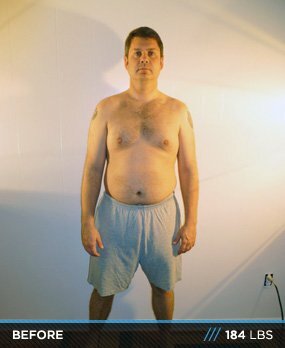 During weeks 8-12, I did not lose any weight. Let me repeat that-I did NOT lose any weight for a month. However, my body composition completely changed! I did not notice the change until I sent the photos to Micah and I could compare that month's photos from the previous month. I was amazed at the change in my body! Micah was supporting me and providing me the advice I needed to not get discouraged all throughout the month. This month was an important learning lesson for me. First, stay focused! Secondly, I learned the impact of 15 minutes. Each day I worked to get an additional 15 minutes of lifting or cardio in each day. Also, I tried to get 15 more minutes with my wife and/or daughters each day. I continued my "15 extra minutes" philosophy in my last four weeks as well. The fat began to almost melt away as I continued my cardio and resistance training. I was stronger than I have ever been in my life. The last month was when my "transformation" truly began to impact me. I was healthier, but also happier. In the end, I was amazed at my accomplishment. I achieved more than I had imagined. I continue to work to get that extra 15-to-30 minutes in my life every day on every level! Note: If I ever got hungry (which was rarely), I would have a scoop of natural peanut butter or ¼ cup of shredded chicken. I watched sugar intake throughout the entire 16 weeks and I never ate complex carbs after 4pm. 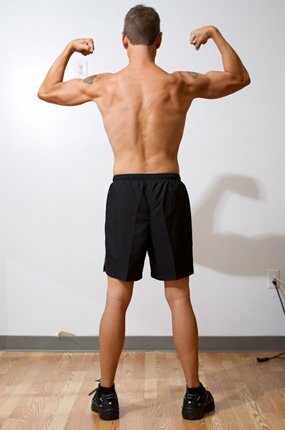 Each month, I had a new cycle of exercises provided by Micah LaCerte from HitchFit.com. I primarily did a 5-day split on lifting and did cardio 5-6 days a week. I typically lifted legs on my off-cardio day. Goal was to have 700-1000 calorie burns per day (5-6 days a week). I did majority of my cardio upon waking each morning. I mixed nonstop distance running with interval training (2 minute fast run with 1 minute walk) for 30-35 minute sessions. At night I would do an additional 15-30 minute run or walk prior to bed. My goal was to continually confuse my body and not get accustomed to any specific cardio cycle. If I could not get cardio in during the morning, I would interject 2-minute sprints between sets while weight-training. I would average 16-20 minutes of cardio during my weight-training session. Find a trainer. Work with someone who creates a program specific for you and that will help you stay accountable. Follow a specific lifting plan to ensure you get in all the exercises and sets you want. Keep a journal of your progress for both cardio (speed, distance, time) and weight training (weight, reps, sets). Work to do better than you did the day before.